For Americans it’s Halloween, but for the English it’s Guy Fawkes or Bonfire Night. 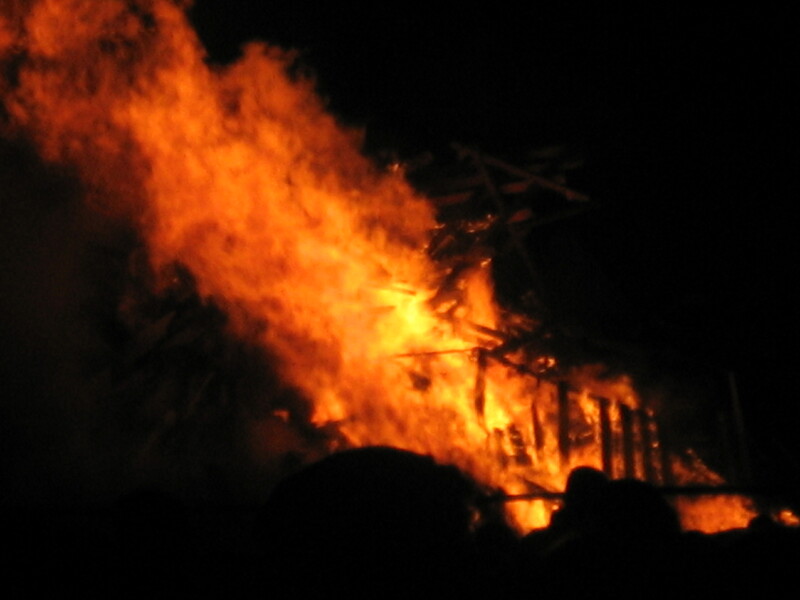 Though Bonfire Night originated as a tradition of giving thanks for the failure of the Gunpowder Plot in 1605, when a group of Catholics led by a man named Guy Fawkes conspired to assassinate King James I, historians and anthropologists also find in the annual observance of Guy Fawkes parallels with the Celtic, or more exactly Gaelic, harvest festival of Samhain — which under Christian influence was later transformed into All Hallow’s Eve, or what we know as Halloween in the United States. Anyway, on the evening of Friday, November 5th, Frank and I were able to participate in the Guy Fawkes celebrations held at Heaton Park in Manchester. Thousands milled about the fairgrounds there enjoying rides and food, while others assembled on a hill above to watch a fine fireworks display followed by a bonfire during which an effigy of Guy Fawkes was burned. Greensboro Public Library has got a couple of books on the history of Halloween, if you’re interested. These are Nicholas Rogers’ Halloween: From Pagan Ritual to Party Night, and David Skal’s Death Makes a Holiday: A Cultural History of Halloween. As I write, we’ve just started on the road to Humberside (the North Sea Coast) to visit Hull, our main object there being to see the William Wilberforce home and museum — Wilberforce of course being the English politician who fought relentlessly to abolish slavery in the late 18th and early 19th centuries.